Sen. Bernie Sanders speaks about the Workplace Democracy Act on Capitol Hill in Washington on Oct. 6. You’ve heard it over and over again from political analysts like me: Sen. Bernie Sanders has a problem with minority voters that will likely prevent him from winning the Democratic presidential nomination if he doesn’t fix it. The latest YouGov poll, for instance, has him winning 34 percent of whites but just 13 percent of Hispanics and 8 percent of black voters in the Democratic primary. You can win Iowa and New Hampshire with those numbers, but not the nomination. The good news for Sanders is that Tuesday’s Democratic debate, the first of the primary season, should give him a chance to ameliorate one of his biggest problems with minority voters: They don’t know who he is. Sanders has become better-known nationally since he launched his campaign April 30, but his name recognition has climbed substantially more among whites than among non-whites, according to YouGov polls. 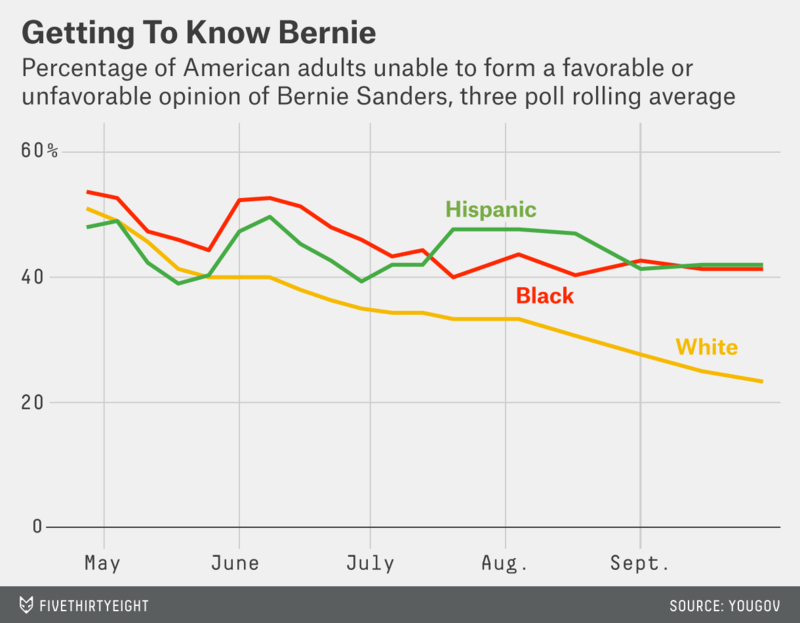 As the chart makes clear, Sanders started off this primary known to a similar percentage of whites, blacks and Hispanics; around half of all three groups had neither a favorable nor unfavorable opinion of him. But while the share of whites without an opinion of Sanders has steadily declined, his campaign simply hasn’t grabbed the attention of minorities. Maybe this doesn’t seem that surprising: Sanders is white, and he comes from an overwhelmingly white state, Vermont. But this problem appears unique to Sanders among Democratic candidates. At least 87 percent of whites, blacks and Hispanics have an opinion of Hillary Clinton, according to the most recent YouGov poll. Lesser-known candidates also have similar name recognition among both whites and non-whites. Martin O’Malley and Jim Webb, for instance, show little gap in name recognition among the different demographic groups. In more than a dozen interviews with political strategists, leading black journalists and activists, there is a common acknowledgement that most African-American voters don’t know who the senator is, and that his messaging to this critical voting base has been poorly executed. For many months, the Sanders campaign did little to make inroads with black voters, in person or online. Will Sanders be able to connect with non-white voters on Tuesday night? On the one hand, Sanders was a good debater in Vermont. On the other hand, the Sanders campaign has known for a while that it has an issue with non-white voters and hasn’t been able to address it. Articles started popping up in June about how Sanders needed to do more to reach minority voters. Similar articles appeared in July, August and September. Black and Hispanic voters may not be rallying behind Sanders’s liberal clarion call because black and Hispanic voters aren’t all that liberal. For Tuesday night’s debate to serve as a reset button for Sanders, minority voters will need to feel that Sanders isn’t just speaking to them, but to their concerns as well. Check our our live coverage of the first Democratic Debate. Recorded as part of Advertising Week 2015. Download in iTunes. Find all the FiveThirtyEight podcasts here.